No catalogue of Israel’s Nazi-like criminality against the Palestinian people can be complete without the story of Hussein Abu Kweik, whose family was wiped out by the Israeli army in a failed attempt on his life nearly five years ago. On 4 March, 2002, shortly afternoon, Abu Kweik’s wife, Bushra, drove the family car to collect their three children from two Ramallah schools, the al-Mughtarebin (Expatriates) school for males and the Al-Fajr al Jadid (the New Dawn) school for females. Neither the Kweiks nor, indeed, their children had the faintest idea that their car was being closely watched and is about to be targeted by an Israeli tank taking position at the nearby hilly Jewish colony of Psogot. Hussein, now 48, knew that the Israelis might arrest him for affiliation with Hamas’s political wing and for making a lot of interviews with the local and international media on Hamas’s behalf. As Bushra collected Aziza, 14, Baraa 13, and Muhammed 9, she drove back home at al Ama’ari refugee camp in Ramallah’s southern suburbs as she did everyday. She was only a few hundreds meters away from home when an Israeli Merkava tank fired two large artillery shells at the car, reducing it to a huge fireball. Bushra and her three kids were annihilated immediately as their charred, dismembered remains protruded from the twisted metal of their Mitsubishi- 2000. The exploding shells killed two more children who were traveling in an adjacent car. The two victims were identified as Shayma Ezzidin al Masri, 4, and her cousin, Arafat Ibrahim al Masri, 16 years old. (Eleven more Palestinians were killed on that day, including a medical doctor named Khalil Suleiman in Jenin, when the ambulance he was riding was hit with an artillery shell). The Occupation army spokesman suggested that their target was Hussein Abu Kweik himself , not his family. With his wife and their thee children annihilated and only a small child, Hafez, spared, Hussein Abu Kweik felt that he was living on a borrowed time and that he had to go underground in order to maximize his chances of remaining alive. His apprehension was vindicated several times as crack Israeli soldiers stormed his home, terrorizing his elderly mother, who since then developed has become diabetic and lost nearly completely her eyesight, and savagely vandalizing property, furniture and house appliances. “We want to kill Hussein so that he will join his wife and children,” the soldiers would tell the old lady. “They would commit every conceivable act of barbarism, including throwing bombs and explosives inside the living room just to make us suffer.” In one instance, Israeli soldiers blasted with explosive the interior of the house, inflicting a lot of damage. Normally, the pretext in such circumstances is to kill “terrorists” who may be hiding inside. However, the real reason is to wreak damage and material losses on the Palestinians. Eventually, on 28 July, 2002, less than four months after the extermination of his family, Hussein was arrested. He spent 58 days “of intensive interrogation and torture” at the Russian Compound Lockup in West Jerusalem during which “every sadistic form of harm” was applied against him for the purpose of extracting confessions from him. According to Abu Kweik, whom this writer met and interviewed him on 11 April, 2007, an Israeli Shin Beth officer code-named Abu Yosef (nearly all Israeli Shin Bet interrogators assume fictitious Arab nicknames) admitted that there was no logical justification for murdering Abu Kweik’s family, except to make the Palestinians suffer. “I told Abu Yosef that I read the Quran, the New and Old Testaments and never saw a more barbaric and more criminal people. I told them ‘suppose that I was the biggest criminal in the world, what was the guilt of my innocent wife and children to deserve this brutal death at their hands’?" In 2003, when Abu Kweik was prosecuted before an Israeli army court, the military attorney couldn’t prove that he was involved in “acts of terror,” especially “serious violations” that, from the Israeli view point, would have justified the decision to assassinate him and murder his family. Still, he was given a 4-year prison sentence on secondary charges, including “affiliation with the political wing of a hostile organization” and “acting as spokesman for Hamas,” and similar routine charges. On 1 April, 2007, he was freed, and allowed to return to his home at the al-Amaari refugee camp. Hafez, his remaining son, now 11, is having mild-to-moderate symptoms of emotional trauma and needs psychological rehabilitation. He is almost morbidly attached to his father and experiences nightmares and other psychological disorders stemming from the trauma of witnessing the brutal death of his mother and siblings. Hussein Kweik has since re-married, but he still can’t get over his haunting catastrophe. “What happened to my family defies linguistic description. The Jews committed a holocaust against my family. And after wiping out my family, they arrested me and exposed me to physical and psychological tortured and unjustly kept me in inhuman conditions for close to 5 years. Kweik is trying “as much as possible” to recuperate from the seemingly irremediable nightmare. He says he now wants to devote more time to rebuild his life and rehabilitate his son. Asked if he would sue the Israeli state for murder, Kweik, after a moment of silence, said: “you know, there is no justice in this world. Besides, Justice and Israel is a contradiction in terms. “I know that had my wife and children been Jewish or American, I would probably receive millions of dollars in compensation. But we are Palestinians and much of the so-called enlightened world treats us as lesser human beings. Even animals in other countries probably have more human rights than we are allowed to …Isn’t this what the Jews and America want”? Asked further what he would tell the Israeli tank crew who fired the two artillery shells that killed his family. “I can’t understand how these states and governments which claim to be enlightened and civilized could remain silent in the face of what Israel has been doing to us? Eid's points, reiterated in the Guardian story, were hardly arguments, mainly the lamentations of a man in the grips of despair. As Abunimeh commented, it was easy to see why he lost. Palestinian 'citizens' of his new state. regular soldier came to reverse the ethnic cleansing. Today seventy-five percent of Palestinians are refugees, "their movable and immovable property confiscated by Israel." assert your identity. You are coming to take back what you had before. On the contrary, rather than "reclaiming" lives, Israel's policies to ensure majority Jewish demographics, disrupt Palestinian lives in ways which South Africa's apartheid policy rejected. Palestinian citizens of Israel and their spouses in the occupied territories. Demographics appears to be one of the main reasons for Israel's opposition to right of return and right of movement for Palestinians in historic Palestine. Israelis, determined to maintain majority Jewish demographics, split hairs regarding the word "should" of United Nations General Assembly Resolution 194. It is an effort in vain. United Nations every year since it was initially passed in 1948. In addition, for those who would presume to "negotiate" away the right of return, it is according to legal experts "a logical necessity for a just and legal peace agreement between Israel and the Palestinians, under international law." Madeleine Albright spoke about houses "built on rubble," and the difficult lot for Bosnia's returning refugees. "It is precisely because what you are doing is hard that I wanted to come here to stand with you and salute you." Very few people "stand and salute" the Palestinian refugees. They are perhaps one of the most 'vilified' groups of people on earth, bombed and massacred in their refugee camps, irrelevant to Israelis, irrelevant to those Palestinians banking on, as Abunimeh mentions, to reign in a little Palestinian statelet. However, they are not irrelevant to Dr. Abu Sitta, who has devoted his resources and his energy on their behalf. "Israel wants to continue its ethnic cleansing, pursue its racist and Apartheid policies, and does not 'really want to live in peace' with the Palestinians but instead of them," he writes. "To speak of a demographic threat is pure racism." The Palestinian refugees should not be irrelevant to American citizens who support international law, democracy, justice and equal rights for all. What would we say about someone who lamented that California's demographics will go from a "white" majority to a "Mexican" majority in the near future? How can we condone that a country, under the guise of filtering out terrorists, but really concerned about maintaining a Jewish demographic majority, destines families to live apart? Indeed, how far will Israelis go to ensure that Israel maintains a Jewish majority? For those who maintain that Palestinians may return to a Palestinian state, I offer the following. I work overseas. Every other year I return to my late father and mother's home. I am not asked to return to Los Angeles, one hundred miles away from my home, nor am I importuned to return to Northern California, in lieu of Central California, which I consider home. We should not expect Palestinians to accept return to a Palestinian state in place of their ancestral home. Al Maseeh Kam! Christ is Risen! 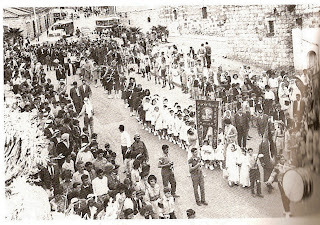 The little girls in white participate in a Sabt el-Nur (Saturday of Light) procession circa 1951-55 in Ramallah. The Boy Scouts (ca. 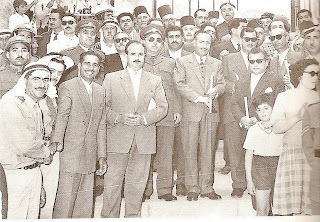 1966) on Sabt el-Nur. 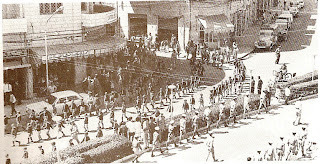 The Scouts are parading toward Manara Square where Ramallah's Christians waited for the Holy Light from Jerusalem. 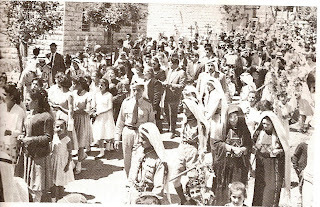 Mayor Jaleel Harb in the center with the lit candle (1957) in front of the Orthodox Church in Ramallah. 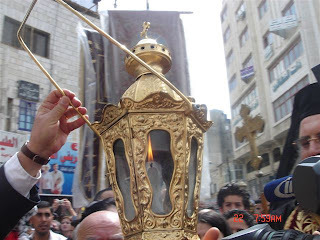 According to Naseeb Shaheen in A Pictorial History of Ramallah "there is a church tradition that long ago, on the day before Easter, light broke forth from Christ's sepulcher." Before Al-Nakba (the Palestinian Catastrophe), which divided Palestine, young men from Ramallah and other Palestinian towns went to Jerusalem to obtain the light. He says that while most of the time the young men from Ramallah won, often "serious" disputes "broke out over who would be first to obtain the light." The most serious were often between the young men from Ramallah and Lod. "Most of the time the delegation from Ramallah won," Shaheen writes. We visited the sepulcher of our Lord. Our Lord is Jesus Christ. With his blood he redeemed us. 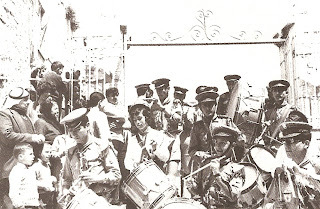 There was no Sabt el-Nur procession in 1987 or 1988. "This was because the previous two or three processions were dispersed by Israeli troops when people from outside Ramallah and youths from nearby refugee camps attempted to join the procession and turn it inot a political demonstration," says Shaheen. The Sabt el-Nur is "celebrated in a subdued manner" since the 1967 occupation, writes Shaheen. Shaheen, Naseeb. A Pictorial History of Ramallah. Beirut: Arab Institute for Research and Publishing, 1992.
what is the sin of our times and our children? 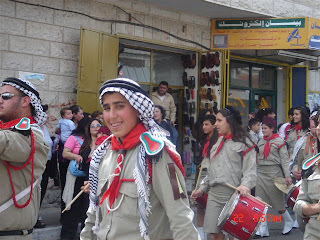 Palm Sunday is quite a festive occasion for Palestine's Christians. 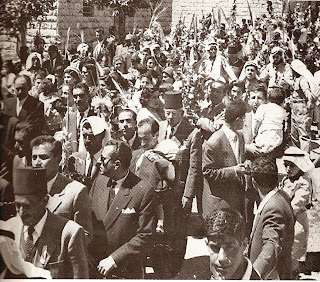 These photos are from Ramallah's Palm Sunday celebrations in the fifties and sixties. Naseeb Shaheen writes that until the 1930's Ramallah ladies held a "day-long dance. Girls and young ladies between 15-25 years of age would put on their best native attire and jewelry (often borrowed from their mothers, older sisters, and aunts), and go to the town's threshing floor or one of several squares in Ramallah. There they formed two rows with 15-20 girls in each row, about 20 metres (22 yards) apart. One row of girls would sing and advance half-way towards the other row, and then retreat to their original position. The other row of girls would then go through the same procedure, singing all kinds of native songs. The dancing lasted most of the day with many townspeople watching that beautiful sight. The Palm Sunday dance was one of the loveliest and most colorful events in Ramallah, as the young girls with bright, lovely faces, lightly danced in their colourful native dresses. Some of the fondest memories of Ramallah held by Ramallah women living in the United States are the memories of the Palm Sunday dances." Shaheen, Naseeb. A Pictorial History of Ramallah. Beirut: Arab Institute for Research and Publishing, 1992.